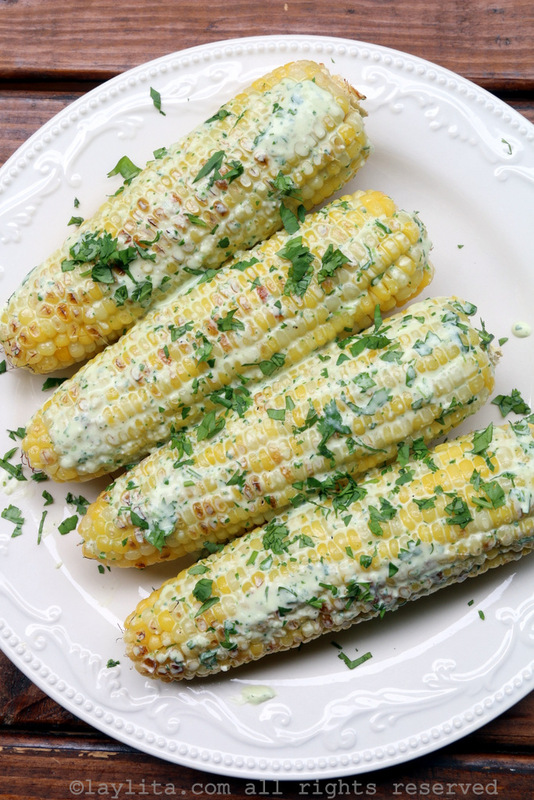 This recipe for grilled corn with a cilantro queso fresco sauce is inspired by the popular Ecuadorian street food of choclos asados con salsa de queso y cilantro. 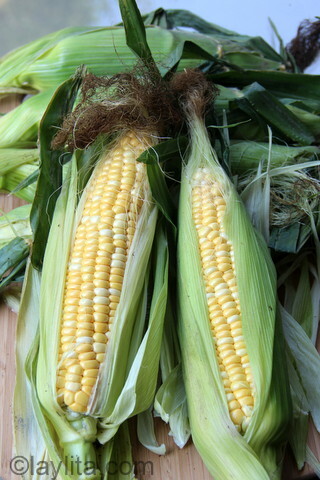 Corn in Ecuador, and other countries in South America, is different than the corn we get in the US. 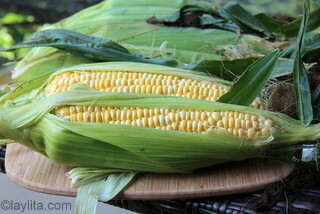 The corn grains are white and larger, they are also less sweet. 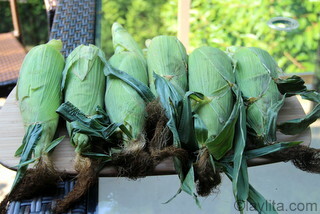 Very fresh young corn or choclo can be slightly sweet, but most choclos aren’t sweet. 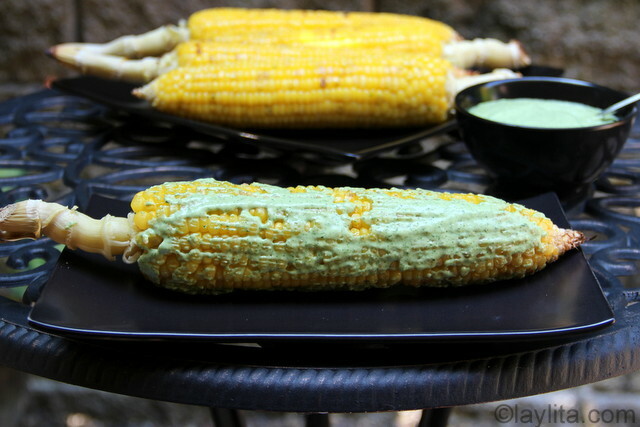 It can throw you off if you’re expecting a bite of sweet corn and instead get something more savory. 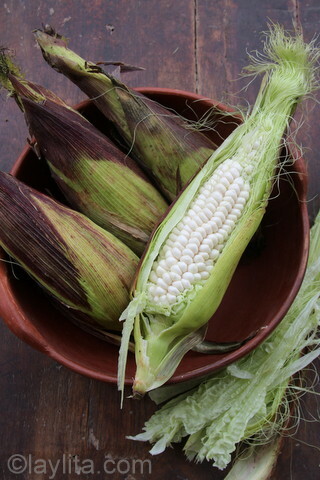 I have seen US style corn in Supermaxi, the large chain grocery store, so American style corn is being introduced into the country, but if you go to a mercado or market, you will likely mainly find Ecuadorian style choclo. 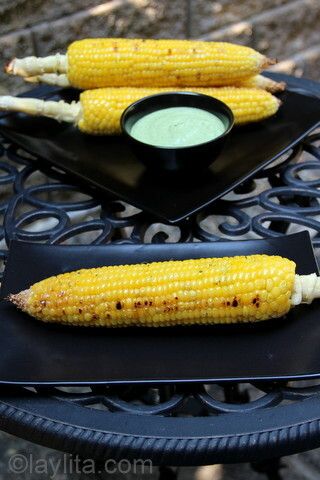 Recipe for grilled corn on the cob with a cilantro queso fresco sauce, inspired by Ecuadorian street food of choclos asados con salsa de queso y cilantro. 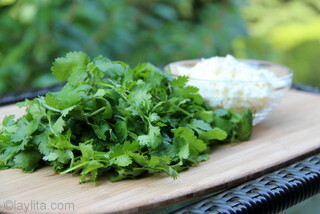 An alternative to making the cilantro queso fresco sauce for those who do not wish to make mayonnaise from scratch with a raw egg is to use store bought mayonnaise, and blend it with queso fresco, lime juice, cilantro, and garlic. Another option for a completely egg-less version is to use heavy cream (alone or with some plain yogurt) or Mexican style crema and blend it with the queso fresco, garlic, and cilantro. 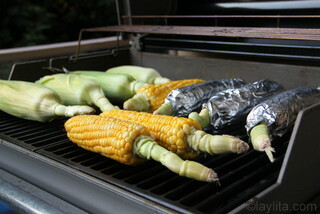 I wanted to test a few different ways to grill corn. 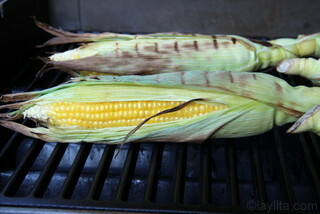 The Ecuadorian corn usually takes longer to cook, so we almost always pre-boil it for 5-10 minutes before grilling it. 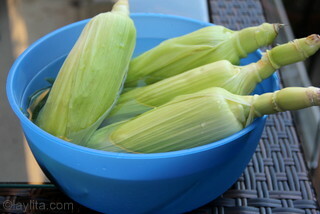 US sweet yellow corn cooks much quicker. 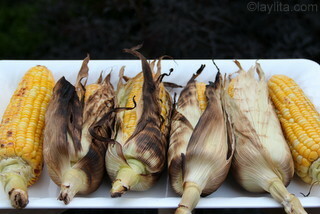 I tried 3 different ways of grilling the sweet corn: 1) pre-boiling it for a few minutes and then finishing it off on the grill; 2) wrapping the corn ears – husks removed- in foil and grilling them, and 3) grilling the corn with the husks on. 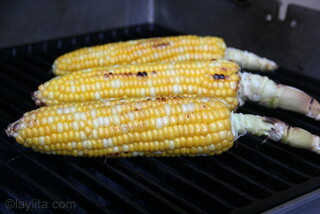 After tasting the corn, I have to say that grilling it with the husks on got the best results; the corn was juicy and full of flavor. 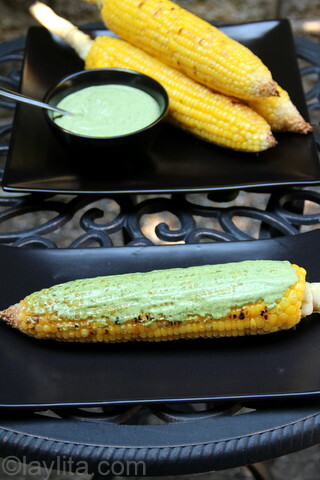 The second favorite was the foil method, it did a good job of keeping the moisture in, but the corn grilled in the husks had the best flavor. 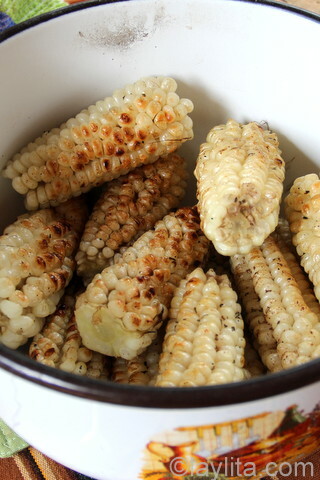 The grilled corn that was pre-boiled was the least favorite, it was too dry – and especially compared to the other 2 methods you can taste the difference. 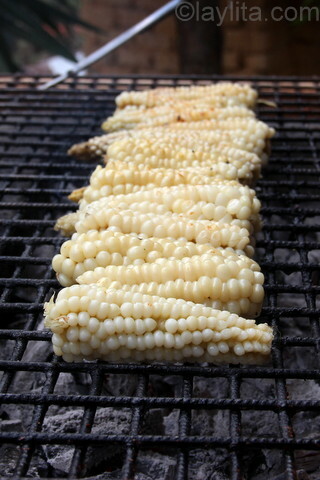 In Ecuador, it’s very common to find street vendors selling grilled corn or choclo asado. 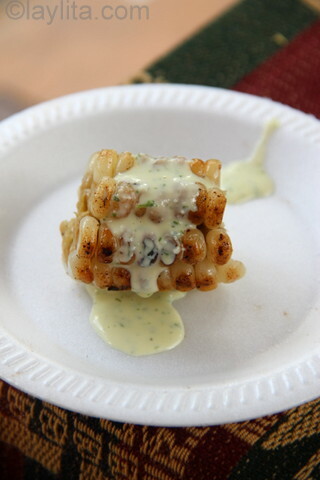 They usually serve the grilled corn with a yummy cheese cilantro sauce or salsa de queso. At first I thought the cheese sauce was very similar to the creamy sauce that is usually served with potatoes. However, while we were having a BBQ at my brother’s place, his wife’s brother, Boris, made the same sauce that the street vendors make. I learned that it’s actually a mayonnaise type sauce. I modified it slightly by adding some garlic to give it a little kick. 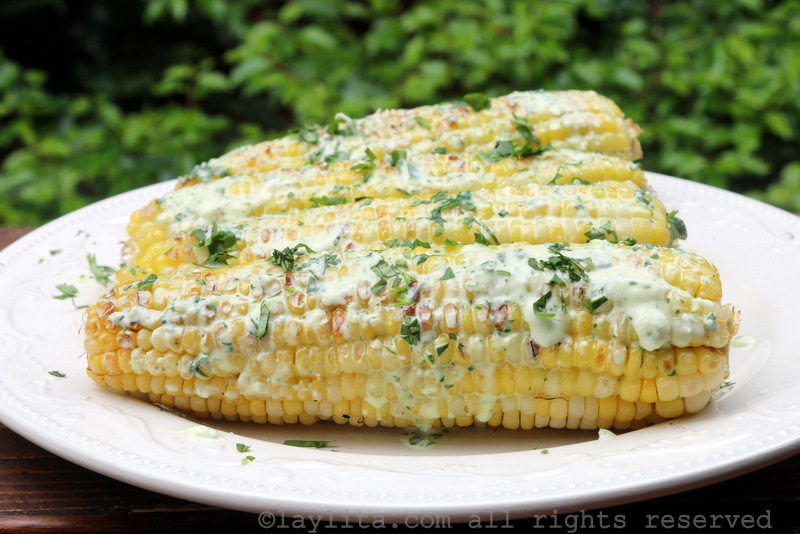 This cilantro salsa de queso is very easy to make and is great with grilled (or boiled) corn. 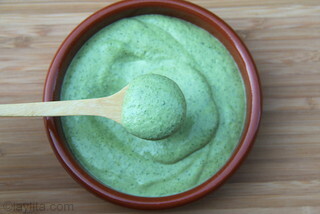 I made the sauce using a raw egg, however if you have any concerns about using raw eggs, then you can make this queso fresco sauce by blending store bought mayonnaise with queso fresco, cilantro, crushed garlic and lime juice. 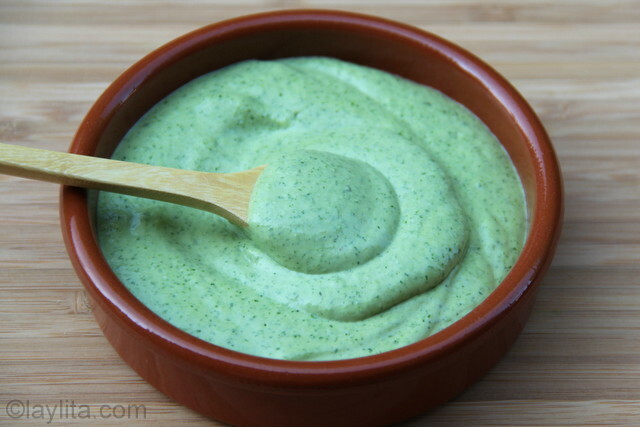 This queso fresco sauce is extremely addictive and is also great as a topping or dipping sauce for carne en palito or grilled meat on a stick, another popular street food. 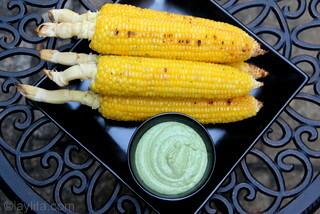 Essentially anything that can be grilled or dipped goes great with this sauce. 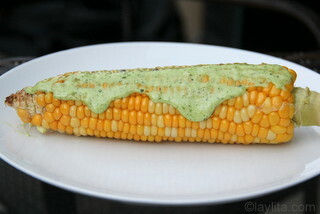 I love grilled corn on the cob. And this sauce sounds so good, it’s making me hungry. Tengo queso fresco en casa y lo preparare. me encato e color de la salsa…que verde tan lindo. I just want to say that you’re awesome. I’ve been looking for ecuadorian recipes in English and it’s been really hard for me to find them, until I got here. 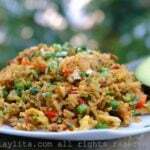 You’re definitely a good ecuadorian cook!! 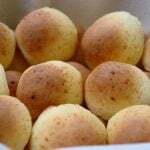 It seems good I ‘ll try them. beautiful post! 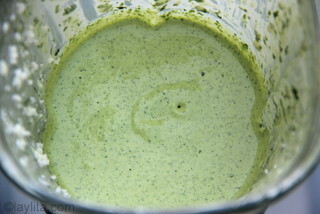 the cilantro queso sauce looks fantastic!